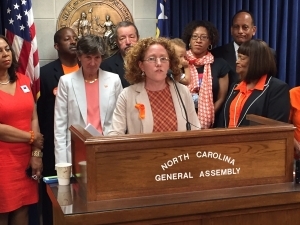 Advocates representing North Carolinians Against Gun Violence, Moms Demand Action for Gun Sense in America, Moms Rising, the N.C. Council of Churches and a bevy of other advocacy groups gathered with several lawmakers at the state Legislative Building today to observe National Gun Violence Awareness day. Bedecked in orange clothing, ribbons and stickers (the color favored by hunters looking to promote gun safety) the advocates told multiple stories of senseless tragedies brought about by lax gun safety policies and asked public officials at all levels to enter into a dialogue about how to prevent them in the future. 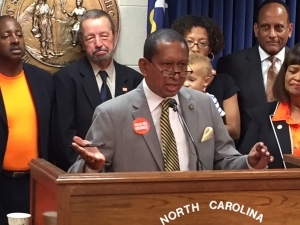 Senator Floyd McKissick, who will headline next Monday’s N.C. Policy Watch Crucial Conversation on the subject, was particularly eloquent in lamenting the seemingly endless list of mass shootings in the United States that have become an almost daily occurrence and in challenging his fellow elected officials to do more about it. 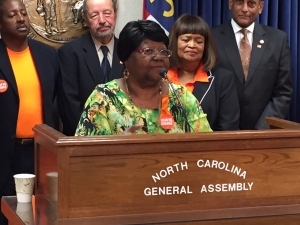 McKissick was joined by several other state lawmakers including House Minority Leader Larry Hall, and Representatives Pricey Harrison, Garland Pierce, Jean Farmer-Butterfield, Verla Insko, Duane Hall and Paul Luebke. In general, there was more of a positive, “can-do” attitude evident at the event than one might have seen even a year or two ago. Perhaps it’s just practice and repetition, but one gets the sense that gun safety advocates are getting better and more effective at making their case and that a real sense of optimism has crept into the movement and that turning the national tide on the issue is a real possibility. National Gun Violence Awareness Day honors the lives of the more than 90 Americans killed daily and the hundreds more who are injured by gun violence every day. In the last ten years (2001-2010), 11,102 people have been killed by guns in North Carolina. 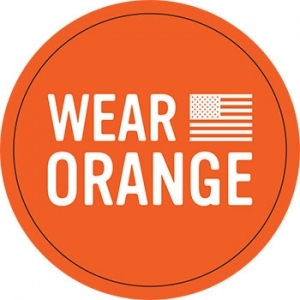 People nationwide also wore orange and used the hashtag #WearOrange in social media to show their support for common sense solutions to the gun violence that takes so many lives. Click here for more information on next Monday’s luncheon: “A year after the Charleston tragedy: Growing hope for saner anti-gun violence policies.” Some seats remain available.